elvisjj, incognitochick and MagpieDucks like this. Looking for a no waste, vacation feeder. Just what I needed. Now I'm looking for a no waste, no pest feeder. Great feeder! Precise instructions with clear photos. Seriously, this could not be less expensive or less complicated. Can be used anywhere. Even an old lady like myself can make these. Best idea out there! Very simple. I made two of these feeders and they are wonderful. Have been using them for almost two years now! Have not noticed any pellets on the floor of my coop. Hmmmm I'm thinking this would work with water... going to try and make a smaller notch! Love the idea! Thanks! Great idea, I have been looking for something that is easy and not so messy, hopefully this will work well for the ducks too! 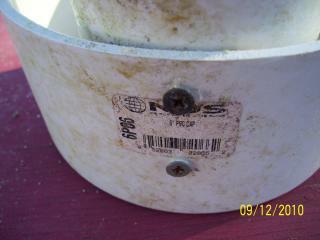 The only 6" cap that I can find in Ontario, Canada is at a specialty plumbing store. And it is a very heavy duty type. Will have to put it on my list next time I'm in the states. did you use a hand saw to cut the pipe? Wish I knew where to get the supplies for $5. I bought a 2' section of 3" PVC at HD ($4 and change), and like others, couldn't find a 5" sewer cap, so I went with a 5" galvanized steel heating duct cap for $5. I took his adive on the grit and oyster shell and went with pieces of 1 1/2" PVC that I had lying around, but a 3" sewer cap is over $7! Great idea, though. Just not that much cheaper than some basic feeders already out there. 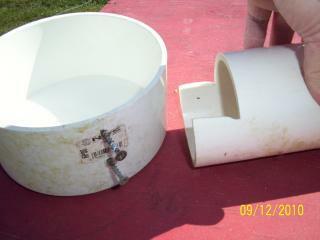 I'm putting mine onto a PVC "feeding station" similar to the one here on BYC, but for use inside the tractor. Good, clear, illustrative photos. Thank you. I made 23 of them for all of my chicks and chickens ! they just give me time to play with my brothers and sisters . 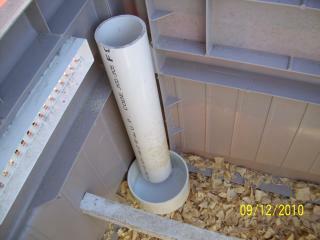 I've seen other pvc pipe feeders, but none like this - looks so simple! I'm gonna' have to shop around for supplies and give these a shot. I think these would be ideal for my new serama coop! Made one last night - about 1/2 hour and $0. Almost all the time was taken up gathering an old piece of pipe, some screws, the rotary cutting thingy and a plastic coffee can. I used the red plastic coffee can - cut to about 2" high as the bottom. The girls LOVE it and since it's hung on a wall the problem of scratching and tipping over is no more. The coffee can is too big though, it tips from the weight and gives them room to scoop. 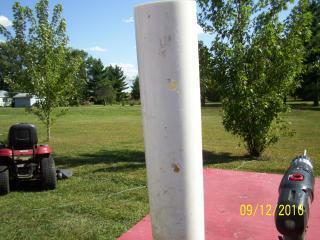 I'll replace it with something that fits closer to the pipe and is taller to eliminate the scooping. LOVE THIS FEEDER. I put on of the 'keyholes' on the back and a nail on a tree in the run and on the wall in the coop. It's super simple to just grap it when I open the pop door and take it outside when I check the water. I cut 1 3/4 inches off the end and predrilled the holes in the cap. I used 1 5/8" course drywall screws to hold it all together. The second one i made i only cut off 1 1/2 inches to make the food a little deeper and minimize waste even more. rws09d -- what was the size of the cut that you made into your 3 inch pipe? I'd like to know their dimensions. 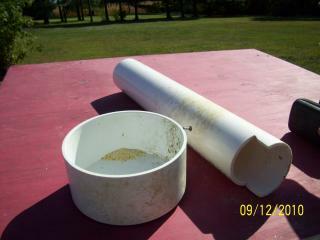 It will be helpful to gauge the depth and width of your cut to control amount of feed available for your chicks. Did you use a hacksaw? Did you use regular wood screws to attach the cap to the pipe? Did you have to predrill holes for your screws? Good for you, rws09d. I couldn't find any 5 inch pvc caps. Was lucky to find a leftover piece of 4 inch pipe at ACE Hardware. After calling Home Depot and Lowes and several Plumbing Supply stores I learned that the industry standard was 6 inches. No one carried 5 inch caps. So I settled on ordering two 6 inch caps, too. Am glad you did the same! And also glad to hear that your hen is wasting less food now. 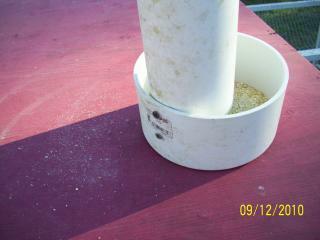 I think the size of the groove I cut into the 4 inch pipe will help control how much feed is available for the hen. ACE hardware was able to cut my 4 inch pipe in half, so I have two two-footers that should help. Home Depot and Lowes did not even carry 4 inch pvc pipes. I made one with the six inch cap and three inch pipe and saw an immediate, drastic reduction in food waste! Ive already made a second for a friend with a very wasteful hen. Even I could make some of these!! First off let me start out by saying I had one of those feeders you hang from the ceiling and it is awful when it comes to food waste. The food sits so close the rim that the food just flies out when the hens peck. The only way to get them to clean up after themselves is to not feed them so they have to hunt for the food. I'm not real keen on making my hens hunt since some of them are visually impaired and it isn't their fault they can't see. -The best thing I like about this design is that you can decide how deep to make the notch so you can decide how close to the rim you want the food to be. I've found that this design significantly reduces the amount of food left on the floor. -It takes up less floor space because it is so upright but it holds more food than my old feeder which took up more floor space. Yes, only two hens can eat at a time but when you let your hens eat as much as they want whenever they want this isn't an issue because they will simply eat at different times. -Its simple design allows for easy cleaning. -Easy mount and dismount. I modified this design slightly by putting a notch shaped like this ----O using a drill and jigsaw, (tale end up) 1/4 from the top and bottom for stability. 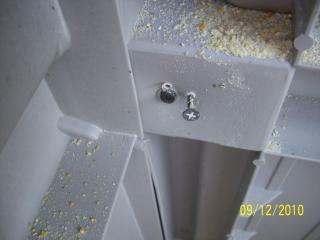 I figured how far from the floor I wanted the feeder to be and put the two mounting screws in accordingly. It literally takes me less than 10 seconds to mount or dismount this feeder which is awesome. -Filling it up is nice depending on how long you make your pipe because if you make it long enough there is no stooping down involved in getting it filled. I made a funnel with a large hole that I hang above the feeder so it's easier to get the food in the pipe without spilling it. One possible downside: I'm not sure where they got their sewer caps but when I went to Lowes they only had 6" ones that were $11.51. I just looked on the Lowes website and there is another type of 6" sewer cap that is $5.22 but the $11.51 was the only one I saw when I was there and at the time I didn't know any better and got them. I already had the pipe so that wasn't an expense but I'd find it difficult to buy the supplies for just $5.00. Do the feed drop directly into the Cap? Your photo doesn't show the notched portion you had originally cut. Does the Cap sit on the floor, and you move it up as the chickens grow? 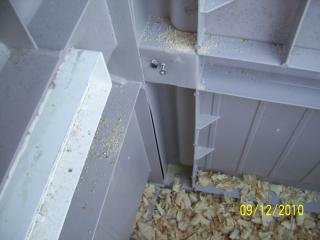 Does the design minimize the feed that is knocked on to the floor of the coop? I'd like to see if I can keep as much of the feed in the cap and not on the floor. Yes, I have put caps on mine and the food flows freely. Unlike those with the curve in them. This is great for preventing the chickens from billing out the food onto the ground. Ohh my. I have been looking to make exactly that, but did not know how. Thank you soooo much. Does it have to be open at the top in order for the food to flow easily? Can it be capped? Lowe's. It's at the end of my plumbing isle. Where on gods green earth do you find a 5" sewer cap? 6" is too big for a 4" pipe I think. I've built one of these since I last posted on this thread. It works great! Thanks again! I built this yesterday for my adult hens. I really like it. It holds a good amount of feed. 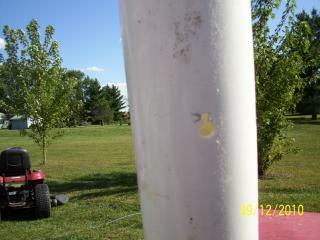 I used pipe hanging straps to secure the feeder to the wall and put a screw through at the height I needed it to be. Thats a great feedre been thinking of doing this myself glad to know it works good. Love this! Going to make a few of these for my coop. It will match the awesome PVC waterer idea I stole from here as well! I like this design. i have looked at several on here as well as Youtube. This seems to be a simple design. Just what i am looking for. Thanks for sharing. I am inspired...I really need to invest my $5 and 5 minutes!!! great idea... I am going to home depot today! Thank you. Thanks for sharing! I shall be making a few of these.